Clth, 9 x 12 in. / 96 pgs / 50 color. Introduction by James Frey. Text by Germano Celant. 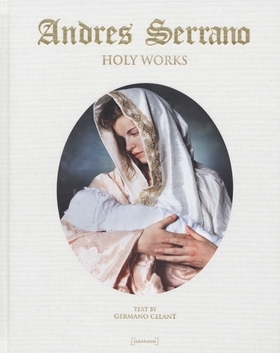 Holy Works is the culmination of Andres Serrano’s vision of Christian iconography, reinterpreted photographically for the present. 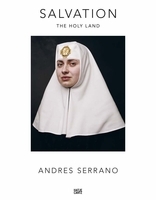 Serrano’s intention with these works is not to recreate specific medieval or renaissance religious paintings, nor to invest them with the iconoclasm that made his name in the 1980s, but rather to renew the genre of sacred portraiture: “Rather than destroy sacred icons,” says the artist, “I reinvent and reinforce them.” Serrano’s subjects for this series are selected from among his friends and acquaintances, emphasizing (like Caravaggio before him) the ordinariness of human features. The genres and themes are familiar, and Holy Works includes a “Last Supper” and a “Stations of the Cross” (rendered as a triptych panel), as well as bolder portrayals typical of Serrano--a “Blood Madonna” and a “Chinoise Madonna,” for example. This volume is Serrano’s major statement of his religious and artistic belief. In a twist on religious iconography, Serrano adds to biblical portrayals such effects as blood and skulls, shifting icons from reverent studies to existential barbs without irony. His trademark provocativeness - as in a shot of a serpent wrapped around a cross - is strong as ever. Text by Nathalie Dietschy, Jan Koenot, Germano Celant, Quentin Bajac. FORMAT: Clth, 9 x 12 in. / 96 pgs / 50 color.